Happy Memorial Day to you and your family! We are relaxing today around the house and will head to a BBQ with friends later on. Meanwhile, there are new, tender plants to tend. I currently have a peony obsession which I blame on the Denver Botanic Gardens. You see, I saw the paeonia "Fernleaf Double Red" getting ready to bloom a few weeks ago at the Gardens. I decided right then I had to have my own, must have my own! And then I found out that they are pretty rare, and tres expensive (about $30-50, bare root). So, I thought it wise not to kill a $50 bare root peony on my first go-round, so I picked up paeonia "Sarah Bernhardt" at the Home Depot for about $14. Here she is: Welcome, Miss Peony. Further blog posts will tell if I become one of those crazy ladies who is devoted to one type of plant or another. Actually, maybe it's not so crazy at all. I have mentioned my new-found peony thing to a few friends and they all tell me stories of their grandmothers' peonies. 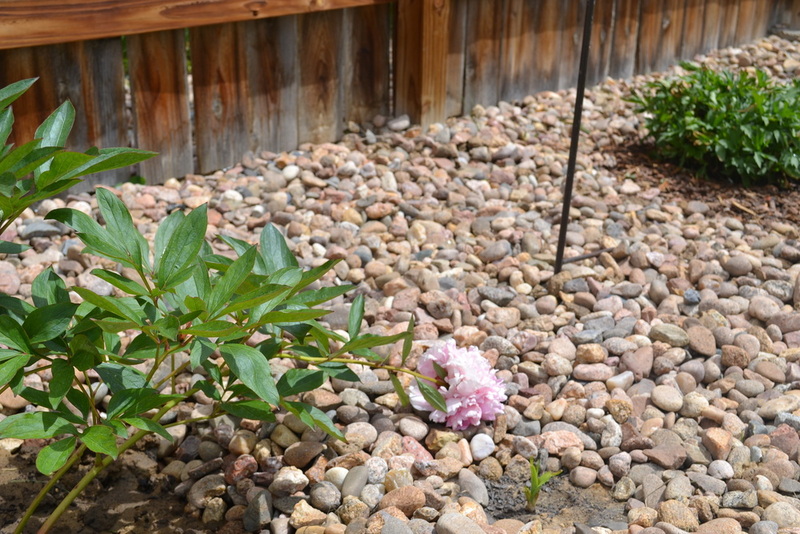 So, if my kids remember my peony bushes, maybe that's not so bad? This is my perennial bed I've been stocking with free, divided plants from friends. I did add a $13 (also from Home Depot) Spirea. Also stuffed in this bed is Shasta Daisy, Jupiter's Beard and a ton of sedum from my dear friend Rebecca. More on her later---she's a very talented landscape architect. The willow structure was Rebecca's idea. I still have to weave in more willow branches. Hope to get to that next week. The kids love playing in it. 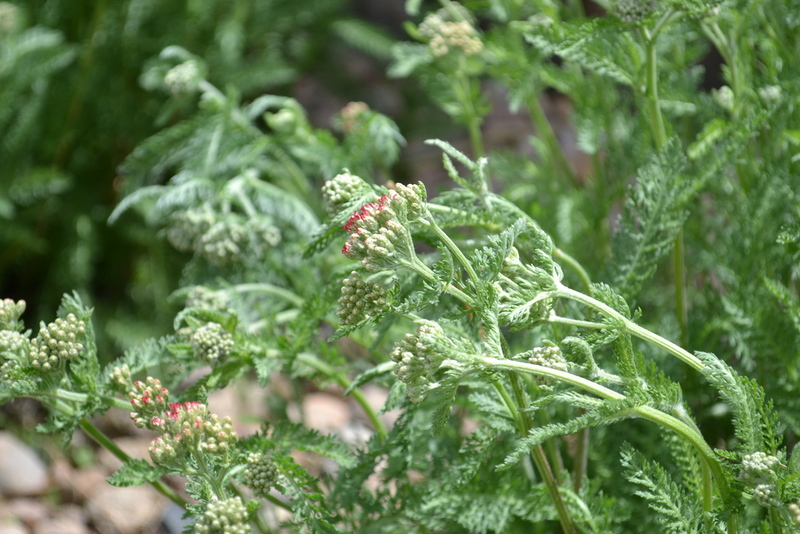 Our yarrow is getting ready to bloom. This variety is "Paprika." I have divided it three times already, and it's headed for a fourth after it blooms. It's a monster bloomer and grower. Nothing much to show in the vegetable garden bed yet. I raised my plants from seeds this year, to mixed results. I've lost all the cucumbers (rats!) and have reseeded those, ever hopeful. You can spy broccoli in the middle and spinach to the far left. Carrots are in the foreground, too tiny now to see yet. Our much-abused bird feeder is hot to trot this year. We are visited by dozens of (fat) birds each day. 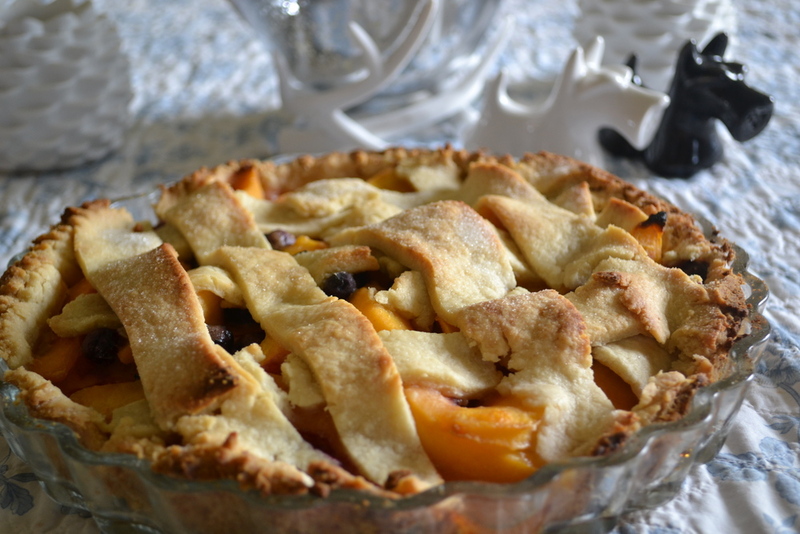 And here is today's Peach and Blueberry pie. The crust I make without fail each time just wouldn't come together today--it was super crumbly, so I couldn't even roll out a top crust. I scraped and rerolled to make a ghetto lattice crust. Here's hoping it tastes good. Or that our friends at the BBQ are forgiving. We hope your holiday is special and full of love and laughing. Thanks for stopping by! We're Jennifer and Jonathan and we are delighted you are reading our domestic art and home ramblings! We create books and modern art canvases for kids at Fat and Appy. Follow us on Twitter or Facebook. Send your peony advice to Jennifer.